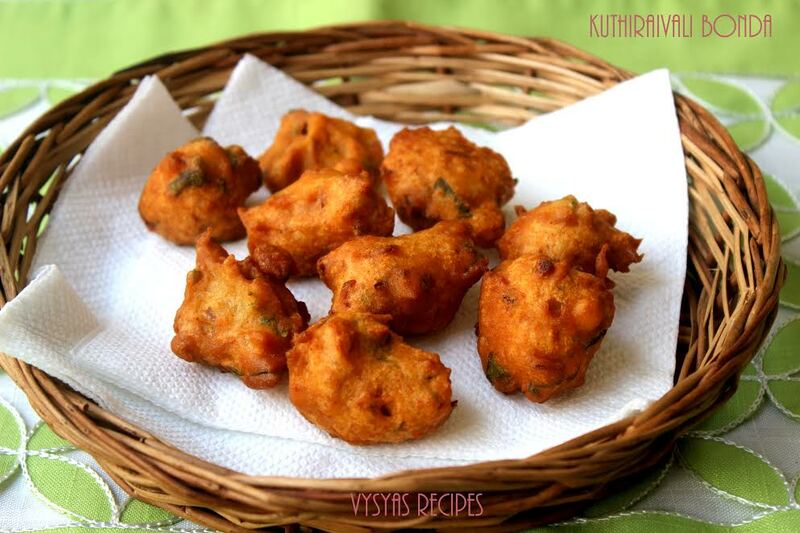 Millets Bonda is a traditional & Popular Evening Snack Recipe made with Millets flour, besan flour & Idli batter. This crispy dumpling is Good to have with Cup of tea. Barnyard millet known as kuthiravali in Tamil,Oodalu in Kannada,odalu in Telugu,Jhangora in Hindi and Kavadapullu in Malayalam.Barnyard millet is rich in High Fiber content.you can try this bonda with kodo millet or little Millet flour also. Kuthiraivali flour(Barnyard Millet flour) - 1 Cup. Besan flour - 1/2 cup. Coriander leaves- 2 tbsp(finely chopped). Idli batter - 1/2 cup. Cooking Soda - 2 Pinch. Soak the chanadal in water for 1 hour. Chop the onion,curry leaves & coriander leaves finely. Take a Mixing bowl, add Kuthiraivali flour,Besan flour, Chopped Onions,Curry leaves,Coriander leaves, Cooking Soda, Chilli powder & Salt. Mix well. Add drained Chanadal & add Idli batter. Give a quick Mix. Now add water little by little & bring it into thick batter Consistency. Heat oil in a kadai, when it is hot, keep it in medium flame. Keep a bowl of water ready. Wet your fingers in the water, take a little batter, shape it into small bonda's and gently drop it into the hot oil. Fry both sides till it turns Golden brown and remove it & place it in tissue Paper or kitchen towel to drain off excess oil. Serve with Coconut Chutney or Tomato Chutney. you can finely chop Amarnath leaves & add to batter. you can make this bonda with little millet or kodo Millet flour also. Adding idli batter gives nice crispy Bonda's. you can add 1 tbsp of Rava for Extra Crispness.